Kristen the Knitting Kninja tagged me to write my memoirs...in six words. I fumbled around for a while, trying to come up with something profound and counting on my fingers all at once. I realized, though, that a lot about me can be summed up by my reaction to this meme - I think I read that somewhere. It's the story of my life. I'm constantly reading something, even if it's just blogs and message boards while I'm supposed to be working. I can't seem to do anything without researching it via the internet and library books and talking to people who might be familiar with what I'm about to do. Cooking, gardening, painting the living room, making financial decisions - nothing is free from my desire to read about it and know all the details. I've also come to prefer my reading for pleasure books to be historical fiction or those in which there's a kernel of truth or knowledge to be gleaned. In special situations, this memoir and guiding principle can also come out as "Hey, they were talking about that on NPR earlier." But that's more than six words, and I don't have a cute childhood picture to illustrate it. This propensity for reading and researching has made me the kind of person that knows a little bit about a lot of things. I'm also the annoying kind of person who doesn't forget all of those little bits. I know what all the weird little tools and kitchen gadgets in specialty stores are called, and I know more than any Midwestern American layperson needs to know about the Plantagenets and the Tudors. I know why bread rises, and I know that clematis vines like to have shaded roots and sunny branches, even though I don't have a single one in the garden. Unfortunately, none of this is terribly practical, and I just end up worrying and trying to do the best thing. (Should I knit two more rounds to make this fit better? This person on Ravelry did, this one didn't, but what will be best for me? Should we refinance now or later? I know all the pros and cons, but I still don't know!) All sorts of obscure factual knowledge doesn't help with those sort of judgments. This is my nature, and I'm afraid it's only going to get worse. I feel sorry for my caregiver when I'm 90. Link to the person that tagged you in your post and to this original post if possible so we can track it as it travels across the blogosphere. Tag five more blogs with links. I'm not usually big on tagging, but I think is a pretty cool meme as those things go. So, here are five bloggers whose six word memoirs I'd like to read. Participate if it catches your fancy, ignore otherwise! It's been a busy couple of months for us, as evidenced by our rate of posting. Work has been busy, we haven't done much worth illustrating, and we've finished it all up with twin bouts of the Flu That Swept the Twin Cities. I finally feel good enough to do more than read trashy novels, sleep, drink orange juice, and cough, so here's the post I've been meaning to make for weeks. 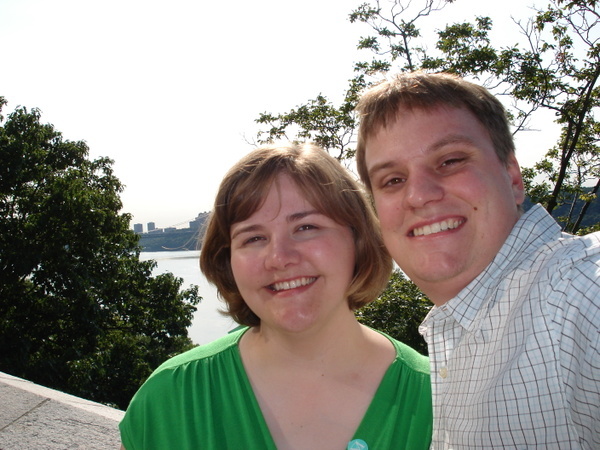 It was about three years ago that we closed on our house. People keep telling us that we've done a ton of work, but it doesn't feel that way to me - probably a side effect of seeing too many before & after Cottage Living remodel features that are completed in the space of a few pages. 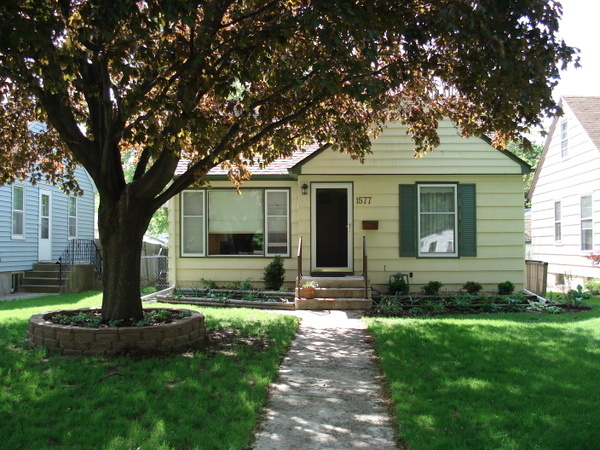 So here's my personal retrospective of the world's slowest low-budget house transformation. At the three-year mark, that is. We're far from done. We refinished the front door, had the house painted in the summer of 2006, and have added more interesting plants in the railroad tie planters, created a new bed on one side of the yard, and added a tree ring planter. Now we're just waiting for everything to grow. Big changes are coming in this room, though. The furniture that's there now (and the giant TV) will probably be moved to the basement, and we plan to replace it with chairs that match the scale of the room a bit better, and hopefully a piano. 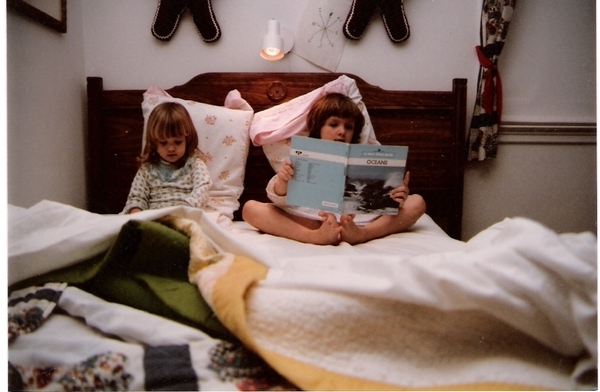 We also hope to finally get rid of the infamous Bone Lamp, which dates from a garage sale during college. New lamps are expensive. Sigh. No word yet on where Craig's favorite ugly blanket will wind up. Generally inoffensive didn't cut it, though. 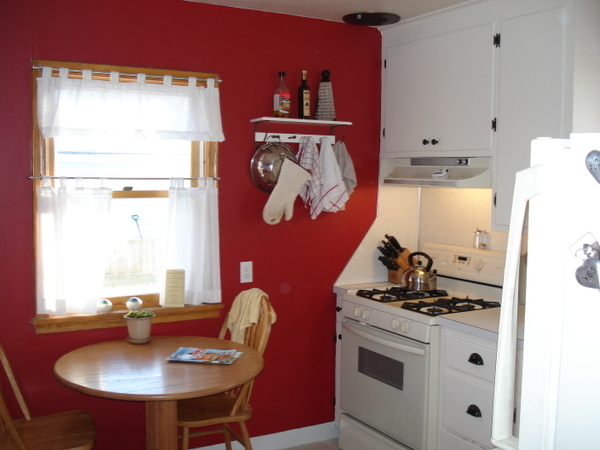 We got a new schoolhouse light fixture for over the sink, painted the walls red and cabinets cream-ish white, and changed out the hardware on all the cabinets. I hope to get Roman shades made in the near future. Still to come - new dark brown Cambria countertops, undercabinet lighting, some sort of non-vinyl flooring, and, down the road, new appliances. 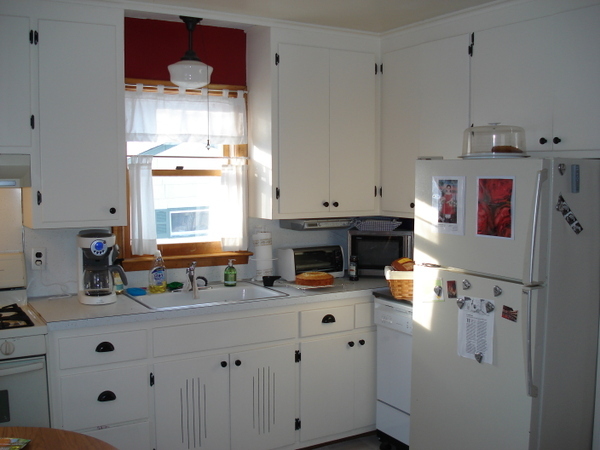 Until the basement and the backyard are done, though, I'm stuck telling people that we painted the cabinets to match the countertops we want, rather than the ones we have. 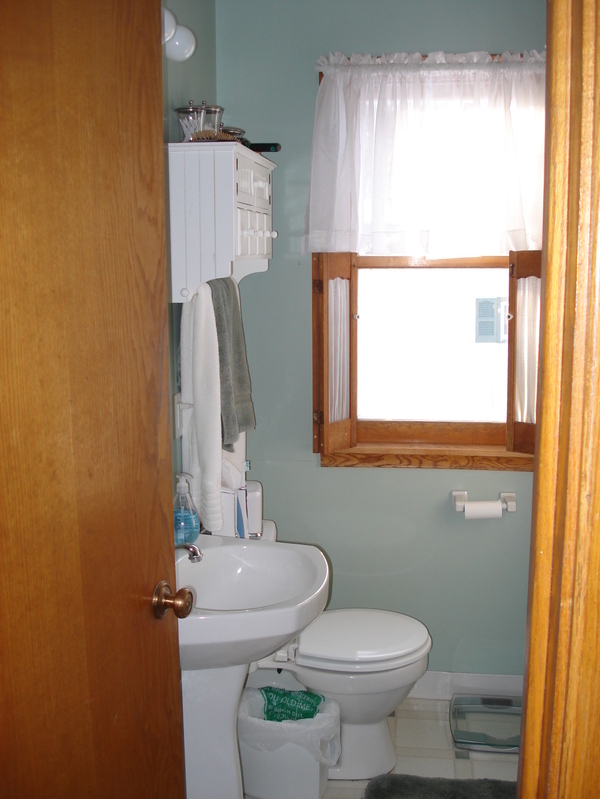 The bathroom on the main floor hasn't changed at all. Three years ago I didn't like the window treatment, and I still don't like it today. Maybe I'll get that changed out by the end of the year. Our wish list for this room includes a new floor with octogon tile and a different paint color on the walls (one that doesn't need to match the vinyl floor). A tiled bath and shower area would be nice, too. There's not much to say about our "dining room." I don't even have a "before" picture anywhere. 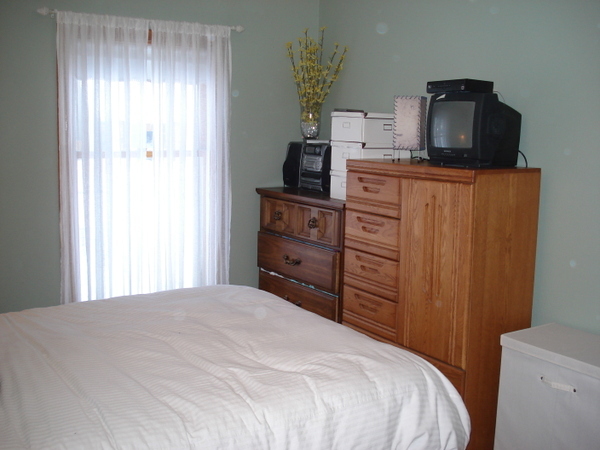 It's really a second bedroom, but currently serves as a dining room on the rare occasions we dine at home with people other than ourselves, sewing room, and storage room. 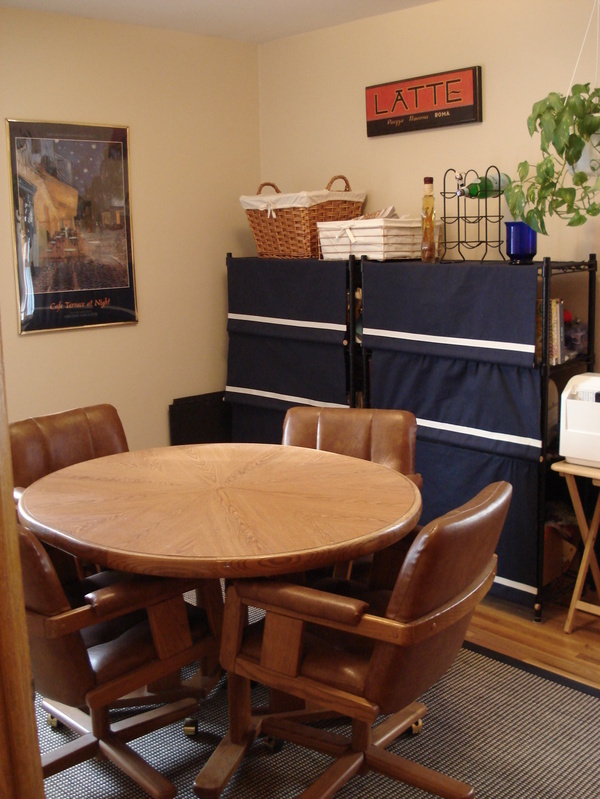 We plan to move the dining table downstairs when the basement is done, and this room will hopefully find another use. The back yard will also be covered in excruciating detail this summer (I hope), so I will leave you with a photo of Projects To Come...our second story, which hasn't changed at all since we moved in. 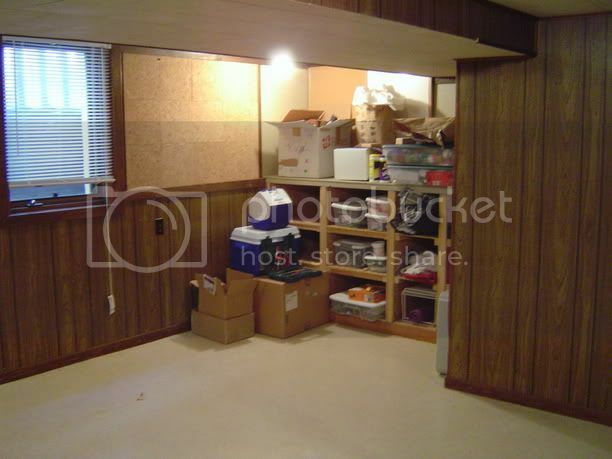 This room functions as another storage room, and is host to most of our embarrassing mess. The office type mess will be moved to the basement, and this will become a bedroom of some sort. Right now, I intend to paint over the wood paneling with a light gray paint and switch out the light fixtures for halogen track lighting, but I'm open to ideas. In the meantime, yikes! Last year, I made a few very specific resolutions for 2007. For the most part, I did well. Despite some slacking off during December, we eat at the kitchen table, I'm not terribly freaked out by the basement, our college pictures are in albums, and I had seedlings become mighty tomato plants. I also started sewing some skirts and other clothes for myself, and learned to knit. These two items may be why I don't feel that I've definitively become a better blogger - my hands are otherwise occupied in the evenings. Finish the basement. 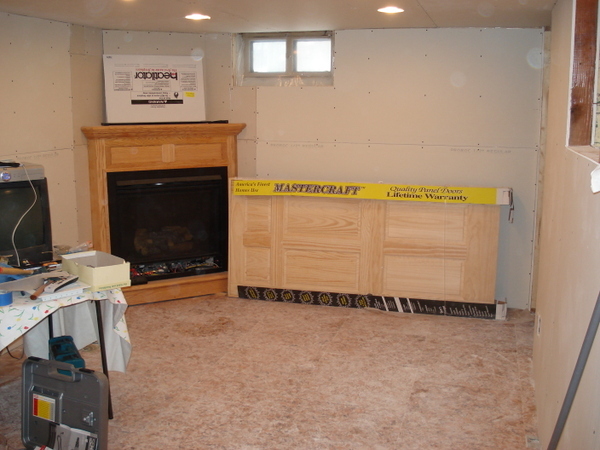 This doesn't sound like a small goal, but my plan is for the basement to be furniture-ready at the end of 2008. The actual process of moving furniture in may take a bit longer, since it will require careful shopping and large purchases. But we'll be ready for it. Start up some yoga again. I'm not an exerciser. I hate getting sweaty and out of breath, and I'm not concerned enough with my own personal image to do it in spite of my distaste. I do like yoga, though - stretching and strength building followed by a nice lie-down on a mat is my kind of activity. My muscles felt better when I was doing yoga regularly, so I'd like to start that up again. Start using my reusable bags. I have a couple of old-ish library totebags that I've been meaning to use as grocery bags for, oh, seven or eight months now. This year I intend to use them. At least once. Make some more crafty posts. I made a post or two about sewing last year, but I never really got in the hang of posting about every finished object I came up with. I'm not really sure how to go about this goal, and even less sure that this blog is the place for it. 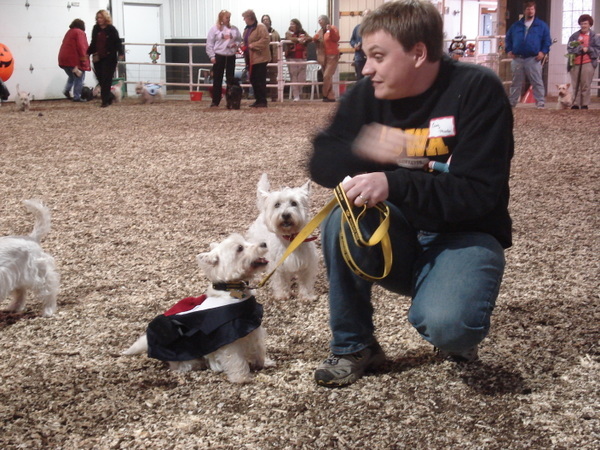 My attempts at a second blog failed miserably a couple of years ago, and I don't think I want to repeat that. I'll most likely look for a way to integrate a photo stream of my projects with this site, or perhaps link to my Ravelry profile once the site is open to the public. We shall see. One way or another, there will be more craftiness. 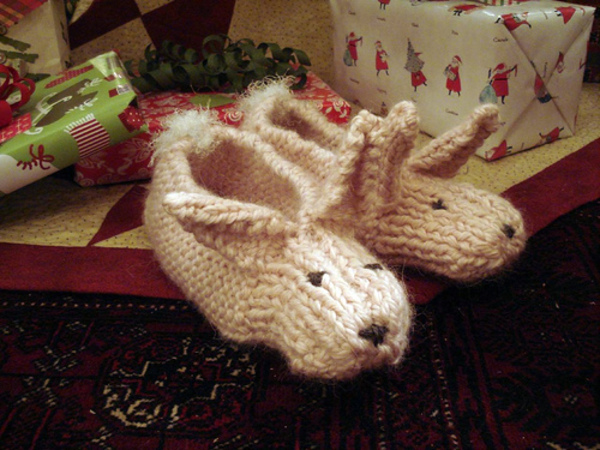 In the meantime, just look at the cute bunny slippers I made for my sister Anne for Christmas! I realize that these goals are all about me. In fairness, I asked Craig if he had anything to include, and all he said was "finish the basement." So never fear, he's accounted for. In Which We Spend Far Too Many Weekends Hanging Drywall Piece by Piece. I've been a neglectful blogger lately - it's been almost a month. 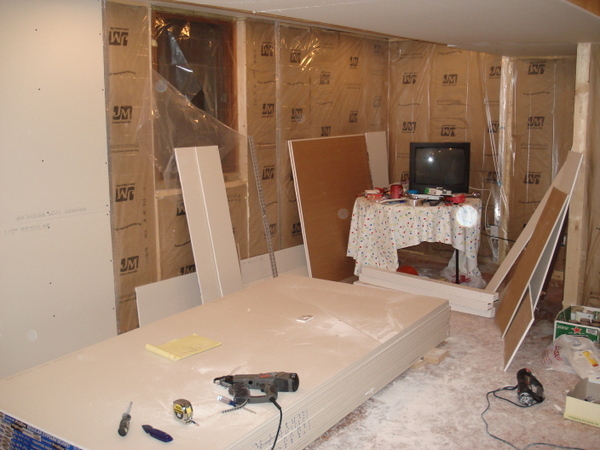 The lag in posting has a lot to do with starting on the drywall in the basement, Brian and Chrissy's return to Minnesota, discovering I like to knit, snow, and the impending Christmas season. We honestly haven't done much worth writing about. The significant thing that we have managed to do in the last month is drywalling the basement ceiling and have gotten a full corner section of wall done. (Credit where credit is due - Dan and Brian helped out a lot.) I think our building permit expires at the end of the year - we're not going to make it. We should only be a month or so late, I think (read: desperately hope). 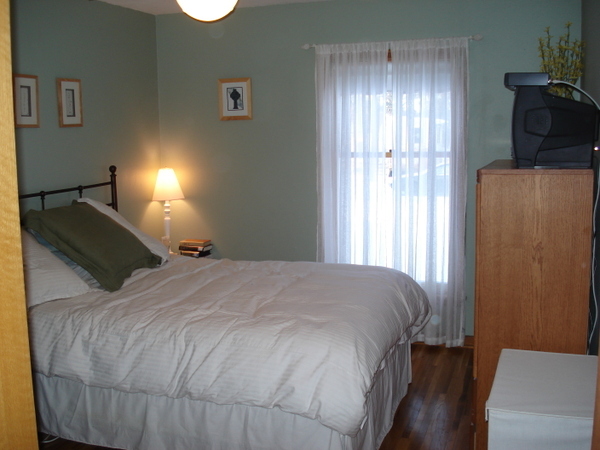 Then we can start on the fun of painting and flooring and making this an actual ROOM. 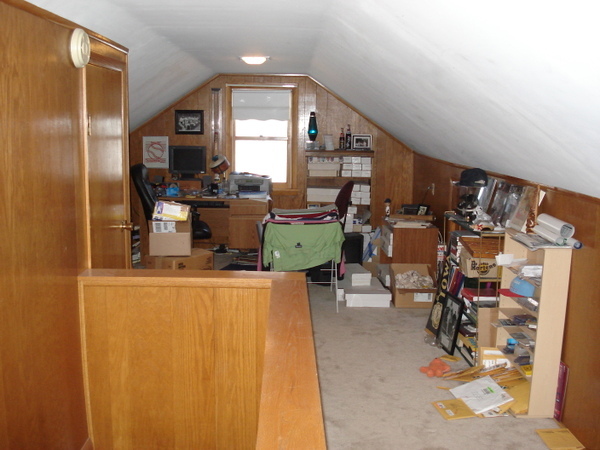 I was just looking over the last post I made about the basement, and got a little nostalgic at how nice it looked all tidy and clean. Drywall has destroyed that, leaving a layer of chalky gypsum dust all over everything. My eyes have been simultaneously dry and weepy for weeks. There are tools strewn all over the place. The trash has not been taken out. We are renovation slobs. See? I've been enjoying the work overall, but I think I'm ready for the heavy stuff to be done. Bring on the girly projects, please! Craig was making fun of me a couple of weeks ago - we did a bunch of drywall work in the afternoon, and then I sat down and sewed a case for my knitting needles. If you need me, I'll just be preening my Renaissance Woman badge. 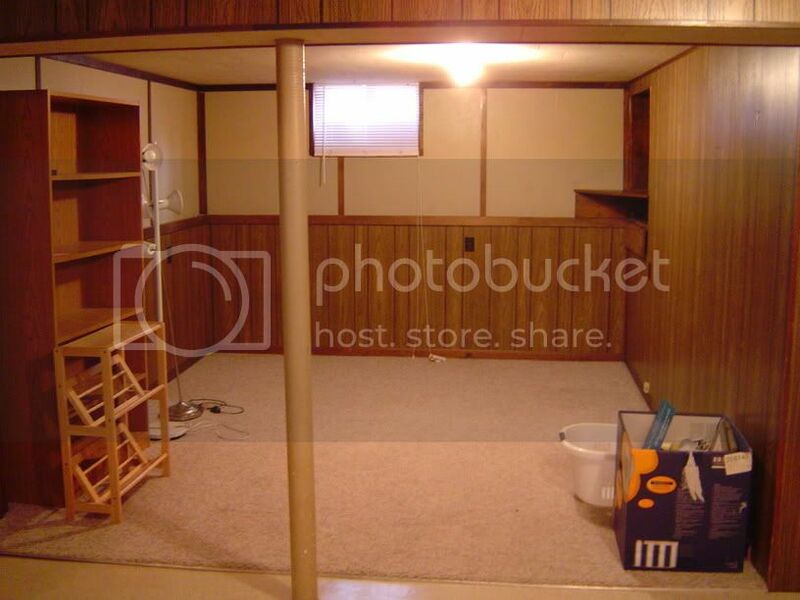 Hey, remember way back when we were renovating our basement? Turns out we still are. Over the summer and the first part of fall, we took a break from the really intensive work and concentrated on things like gardening and grilling and going on vacation. 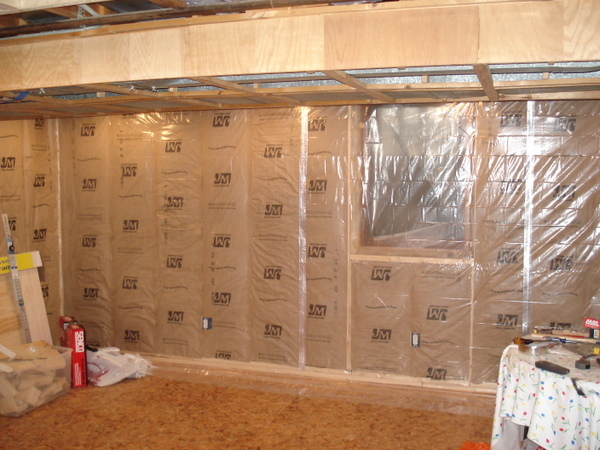 We worked in the basement every now and then, though, and got the insulation done. 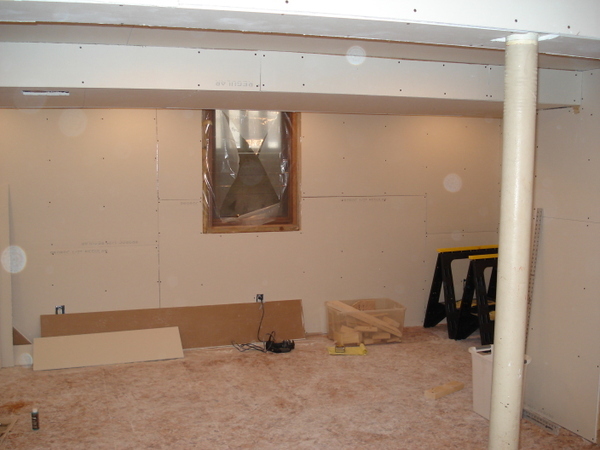 We passed the insulation inspection this week, and are ready to start hanging drywall. It looks more like a room now than ever! 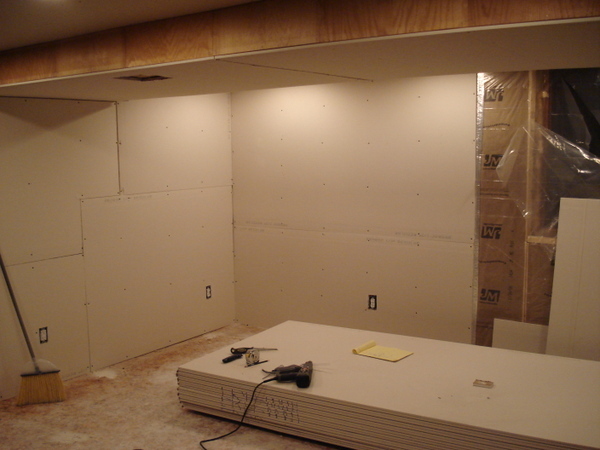 We have R-13 insulation in the walls, and R-28 in the ceiling, primarily for sound-deadening purposes. The wood floors on the main floor don't provide much in the way of a barrier. You can also see our makeshift setup for a flat screen HDTV that we don't yet own. 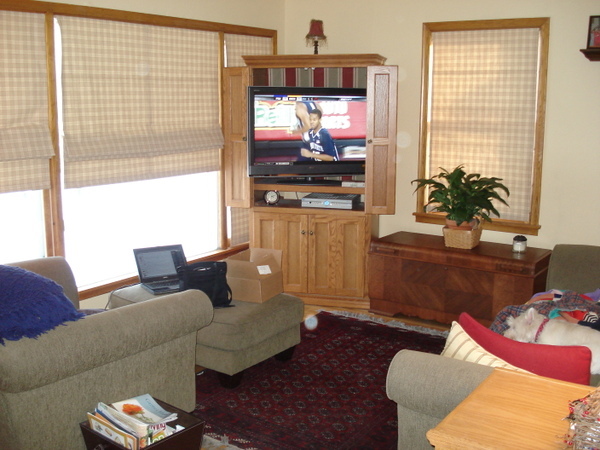 All the cables go through the wall - there will be some sort of bookshelf or console to hold the TiVo, DVD player, and whatnot down below, and then the television will be mounted on the wall, with no cords in sight. Sweet! Looking the other direction, into the dining and office area. 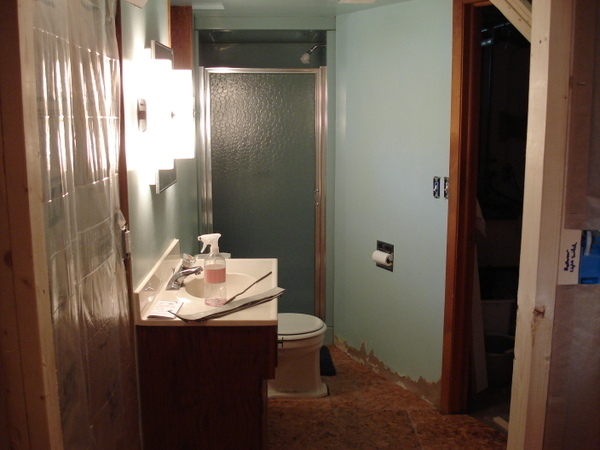 Even though not a lot of work has been done, the bathroom gets a shot for good measure. 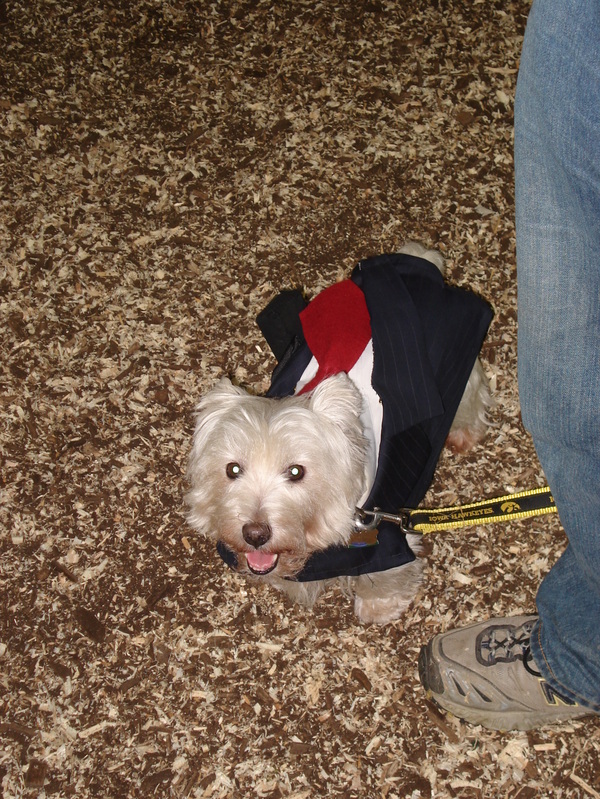 We attended the Memory of Monroe Scottie Rescue Halloween party again this year, but had a really hard time coming up with a costume idea for Phoebe. After much racking of brains, we settled on a lawyer costume. I cut up one of Craig's old suit jackets and a dress shirt, and tacked the two together. The spider was actually pretty easy. I probably could have done it with just a knife. 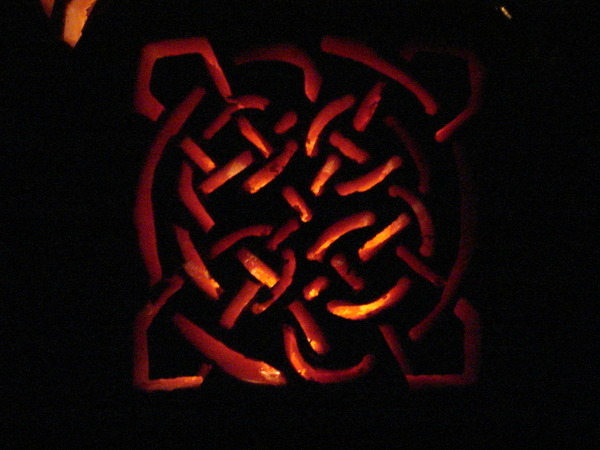 The Celtic knot, on the other hand, was ill-advised. 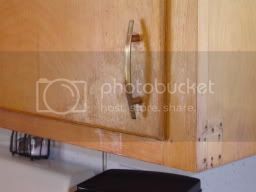 Martha Stewart's website has helpful templates and pretty pictures of these, which lulled me into a false sense of capability. 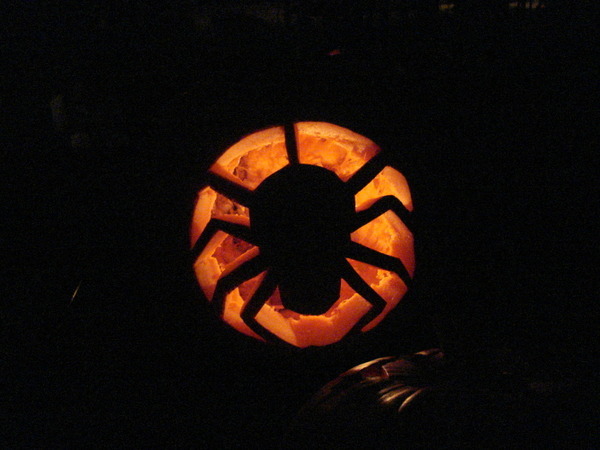 After looking at the website again, I saw that she called for one of those permanent foam pumpkins, which would have been much easier to carve, and not nearly as tempting for the teenagers of the neighborhood to smash. Seriously, if this gets smashed, I may fall into a puddle of tears or go on a homicidal rampage. Probably both. I had a really hard time working through the varying thicknesses of the pumpkin, and ended up using a drill for parts of it. 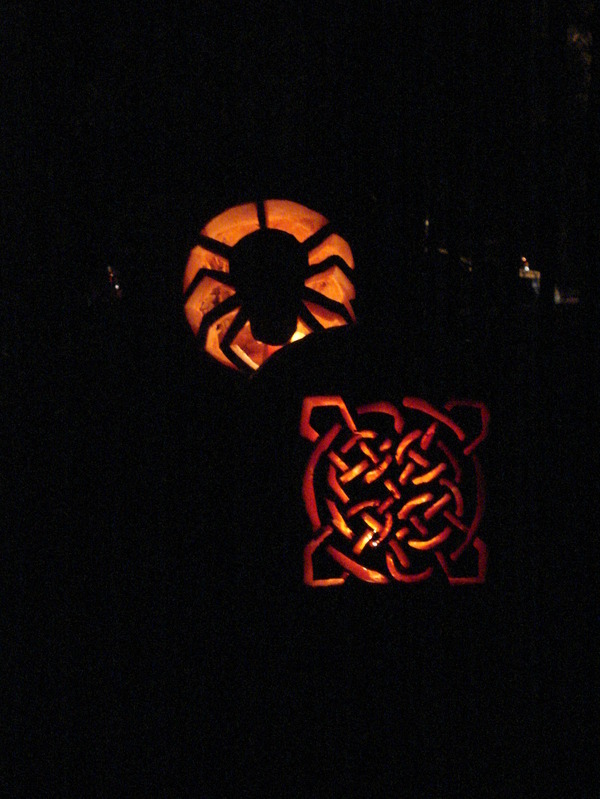 It is a consolation, though, that jack o'lantern is a fairly forgiving medium, and it still looks pretty cool in the dark. 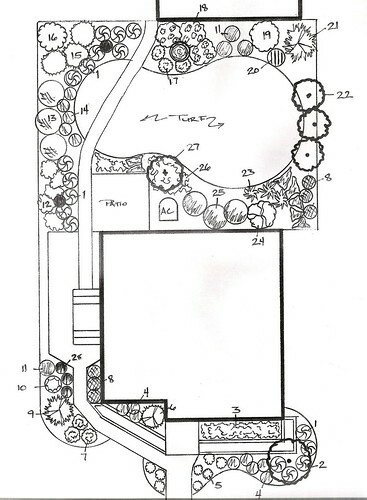 I've dithered about our landscaping plans and what they're going to cost in the blog before. This time, we've finally bit the bullet and decided to get it done, hopefully sometime next summer. This is one of the things we're not really comfortable with doing ourselves, so we're going to have to save up the cash for a landscaper. From what I can tell, we have reasonable quotes, but this sort of thing just adds up. I'm not going to name the total sum, but it has more than four figures and less than six. For some people, it's probably not a huge hurdle. For us, though, it's a chunk. We don't have it just lying around and we refuse to take out a loan for this sort of thing, so we need a plan. I'm the money person in our household, and I like to think of myself as a reasonably frugal person. I'm not dumpster diving or eating rice and beans for every meal, but 80% of the movies we see come from the library and I religiously save my Cool Whip and yogurt containers for future use. We have a budget. I come from a family known to speak in reverent tones of someone who put cardboard in his shoes to cover up the holes in the soles. My grandfather the Ph.D. got his clothing from the church rummage sale, but only on the last day, when everything was half price. I've got the basics down, but I've got my issues. I'm willing to eat out at the drop of a hat despite having a freezer full of food and a meal plan, and my nascent crafty side thrills to the siren song of fabric and yarn. Magazine subscriptions just seem to multiply. Craig has toned down his purchasing sports memorabilia a lot, but will still shell out for little pieces of cardboard with pictures of men on them. (They just have to be the right men.) I long to be able to practice the kind of "cheerful frugality" that Meredith at Like Merchant Ships demonstrates. I know it takes time and effort, but it just seems like so much fun as I lurk around similar blogs. The bottom line is that this is something we KNOW we can do, we just have to set our mind to it. We can reach about 75% of our goal simply by putting away a piece of each paycheck. It's just that last 25% that's going to be hard, especially as we continue to work on the basement and contribute to our other savings. We both have enough work with our full time jobs and neither of us wishes to revisit the retail hell of our college years (even for a few months), so we're going to have to get creative. Selling off stuff, paring down bills, everything is fair game. It'll be an adventure with a barbeque at the end. As of today, we've saved $250 toward the goal. Ready, set, GO! Who wants honey/As long as there's some money/Who wants that honey? As silly as it sounds the Smashing Pumpkins album Siamese Dream is a really important album to me. I'd never really listened to all that much music until I put that cd on and the opening drum rolls of Cherub Rock (the lyrics in the title are from that song) came on. Ever since then I've been hooked not just on the '90s alternative rock that first grabbed me, but all good music. I've been fortunate to see the Pumpkins in concert in both 1996 at the Target Center and in 1998 at the free outdoor show in downtown Minneapolis that drew over 100,000 people. On Tuesday Carl and I headed to Roy Wilkins' Auditorium to see them for a third time, but the first without original band members James Iha and D'Arcy. I was a little concerned that without them the show wouldn't measure up, but it did. They played a ton of old stuff to go along with some of the new stuff off Zeitgeist (an album I don't own and haven't actually heard most of), and Billy Corgan (while not aging gracefully) still rocks. The crowd wasn't fabulous, but that is too be expected when those of us who weren't in diapers when Siamese Dream first came out are a little old to be crowd surfing and in mosh pits. We don't want to break a hip, you know. Apart from the concert I just completed my second week at my new job and things are going very well. My coworkers are great and I'm loving the chance to be a "real" attorney. I actually had my first court appearance on Wednesday and even though it was a default motion where the Defendants didn't appear it was nice to get that out of the way. Anywho, that's all for now. It's almost time to watch the Hawkeye football team get blasted again. What was intended to be a break from the basement that lasted a month or two turned into a full-fledged summer vacation. Summer was what summer should be - gardening, long family weekends, vacation, grilling, and baseball. We didn't ignore the house completely, though. In preparation for what we hope will be next summer's big patio, fence, and regrading project, we made a couple of changes in the backyard. Be forewarned - they're less than glamorous. One of the trees in our yard suffered an untimely death last summer. We went through a week of temperatures over 100 in July or so, and all of the leaves dropped. You could almost hear a "whoomph," it happened so fast. The arborist we had investigate said that the roots had curled around themselves, essentially choking the tree to death. So that's a cautionary tale - make sure to break the roots up and spread them out really wide when you're planting trees and shrubs. 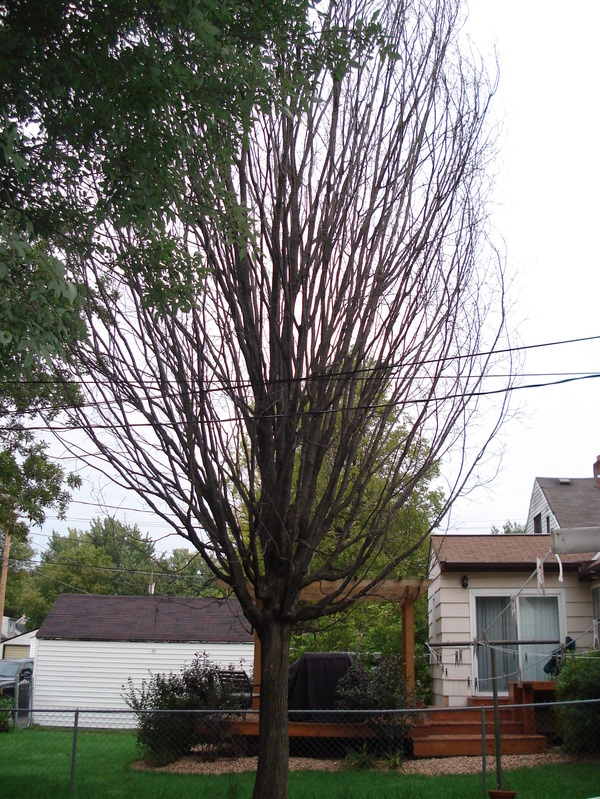 Here's the tree, as it looked this summer. Dead indeed. So we bit the bullet and had a tree service come out and cut it down. This had the unanticipated benefit of slowing the stream of guys coming to our door and asking if they could cut down our tree. Maybe we're just over-cautious, but letting a total stranger with no references come onto our property and operate heavy machinery just doesn't sound like a good plan. There seem to be plenty of people who think that they'll make some money that way, though. The yard feels pretty naked now. Eventually we'll have a privacy fence put up, and we plan to plant a few lilacs close to the fenceline. For now, I just feel exposed. The stump will be ground down in a few weeks, so at least we get some free wood chips out of the deal. 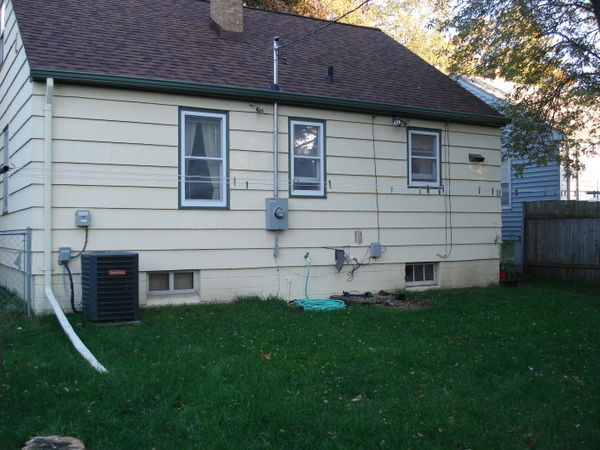 We also had our air conditioner replaced and moved to the corner of the yard. I don't know quite when the old one had been installed, but it had olive green plastic trim, which makes me think it was at least as old as I am. The real problem, though, was that it was installed right in the middle of the back of the house, making any sort of patio installation a problem. 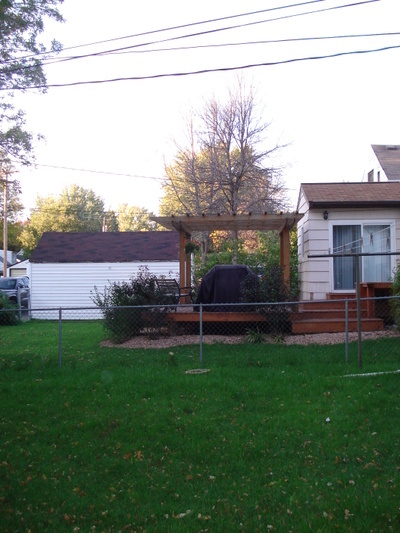 When we had our landscape plan drawn up, the designer placed a patio on the corner of the house. That was great, except that anyone sitting on the patio in summer would have loud AC noise directly behind them. When the system started to take six hours to cool the house by about 4 degrees, we decided it was the perfect time to get the darn thing replaced and moved. There's a lot of painting and tidying up that will need to be done, but at least everything is in the right place now. You can see the location of the old AC unit just to the right of the hose. The new location will be much better for everyone. So, things still look a bit patchy, but we are READY for the men with the bulldozers to come and make our backyard an inviting green paradise, a sylvan glade in the city, a refreshing private oasis! We've been on vacation the last couple of weeks, but are now back at work and dealing with the customary post-vacation colds, lack of motivation, and sleepiness. 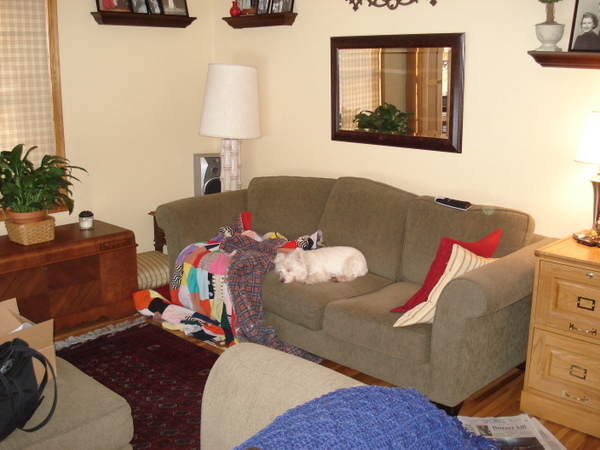 The house was clean for the two glorious days that I was home but not not back to work, but now the dishes, newspapers, and folded laundry are piling up as I sit in the chair with my box of Kleenex. Give me another week, and I may be able to function as a normal human being. 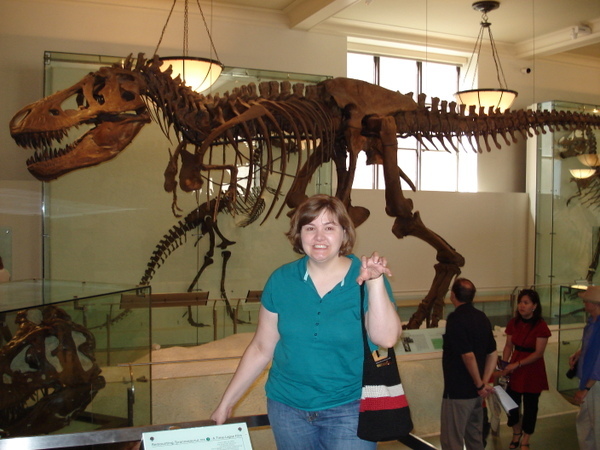 We went to New York City for five or six days, then rented a car and drove to Cooperstown for the Baseball Hall of Fame. From there, we went on to Niagara Falls and flew home from Buffalo. I'm posting a few pictures - if you're really bored and want to look at all of them, they're in their own set on our Flickr page. We started our vacation of Labor Day weekend, which meant that things were packed. 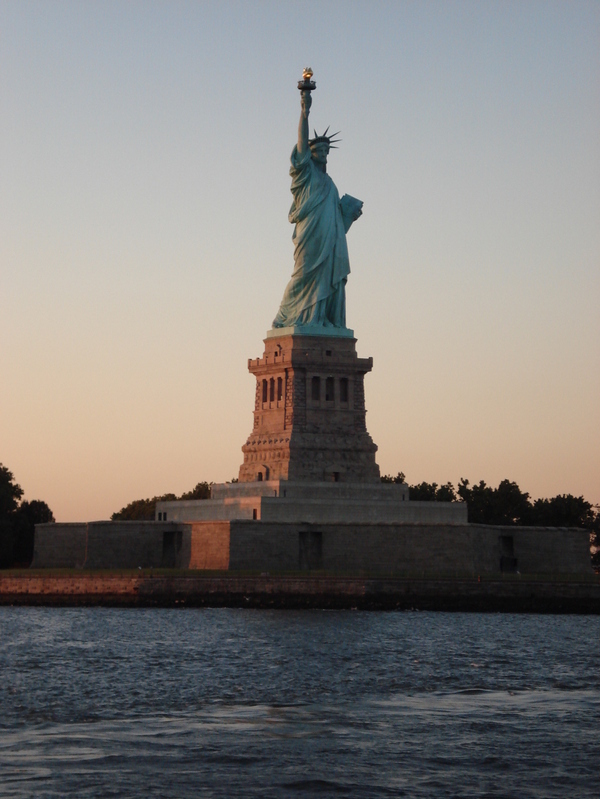 It's Manhattan, sure, but it seemed that every annoying tourist in the Western Hemisphere had come out to play, and was in line to catch the ferry to Ellis Island. 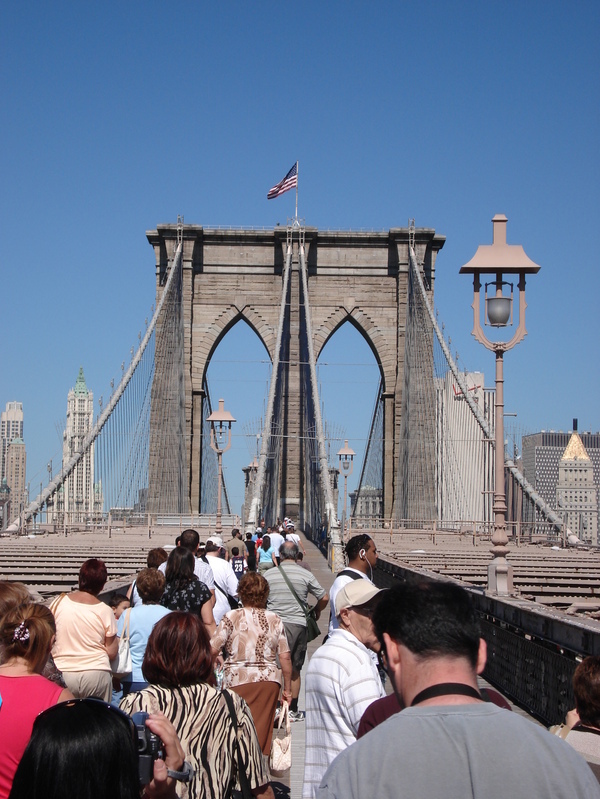 And cross the Brooklyn Bridge. There is no Ellen, only Zool. Craig and I discussed how Ghostbusters would make a really great musical. It has everything - action, love fulfilled, love unrequited, comic relief... Ask us about it sometime, and we'll tell you how you can invest. We went on a "Harbor Lights" boat tour, which turned out to be really nice. It was great to sit and feel the breeze after a day of walking. 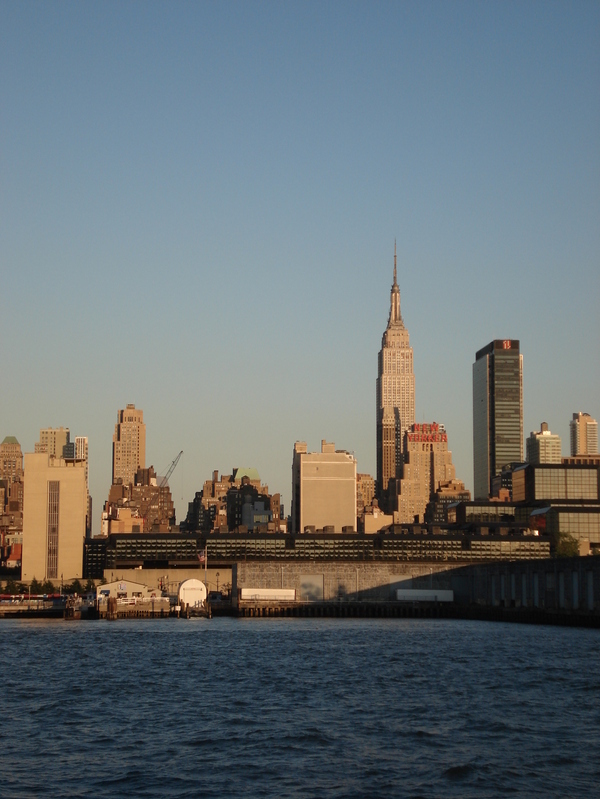 Here's a view of the Empire State Building. Our hotel is the building covering it up on the lower right hand side - it says "New Yorker" across the top. The location was really fabulous, and everything else was....adequate. I think Circle Line Ferries must have their boat tours calculated to the minute for maximum photo-taking happiness. Grr. Ellen is super scary. 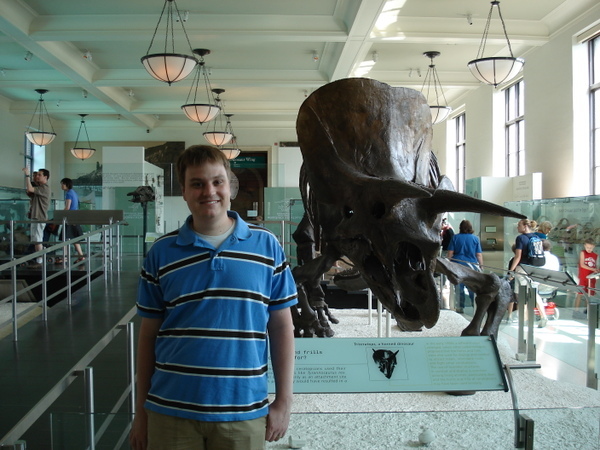 Craig wanted to be a special little snowflake when he was younger, so his favorite dinosaur was Triceratops, not T Rex. 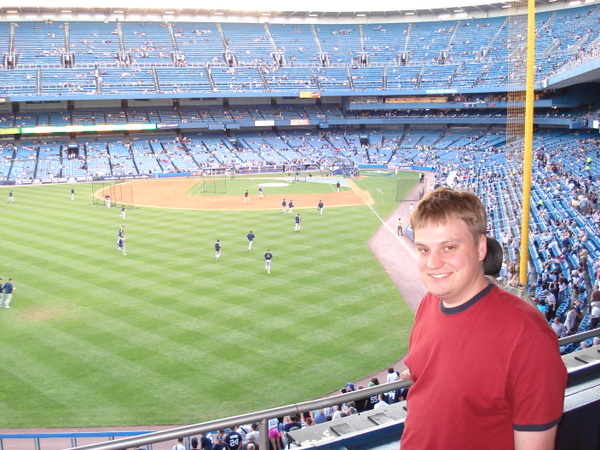 Yankee Stadium! Alex Rodriguez hit a home run into the seats above us here in left field. 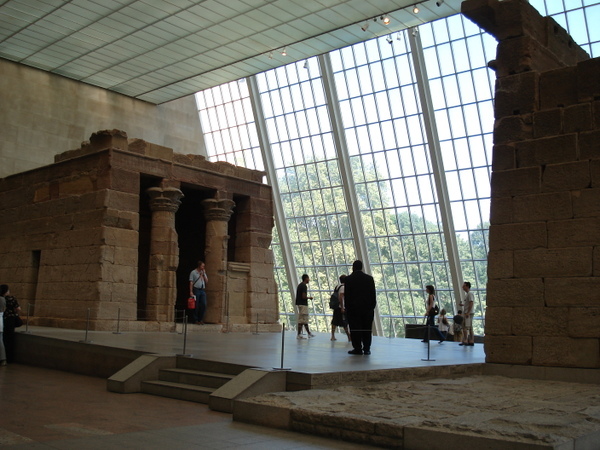 The Temple of Dendur, reassembled in the Met. This was a really cool display to just walk around. The museum is right on Central Park, so there was a girls' soccer workshop going on just outside the glass wall. 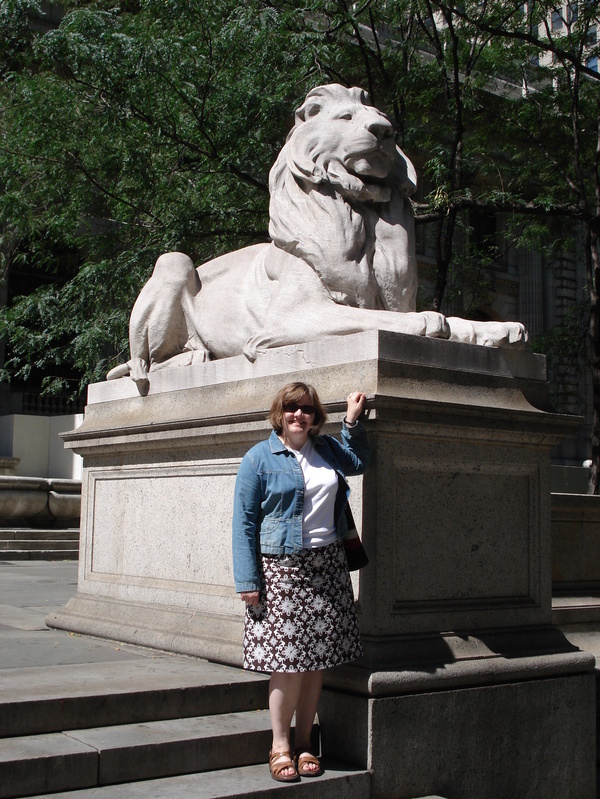 Just outside the Cloisters, which is the Met's outpost of medieval art and architecture. I loved it - it was a great break from noise and dirt and bustle. And, for the most part, the annoying brand of tourists. Good morning! 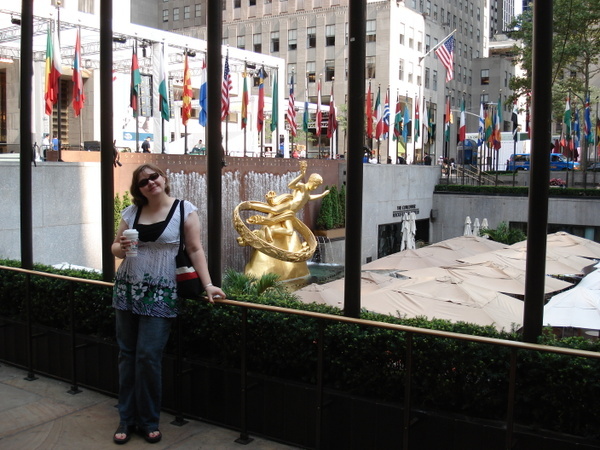 We ate breakfast outside at Rockefeller Center before moving on to a tour of the NYC Public Library. 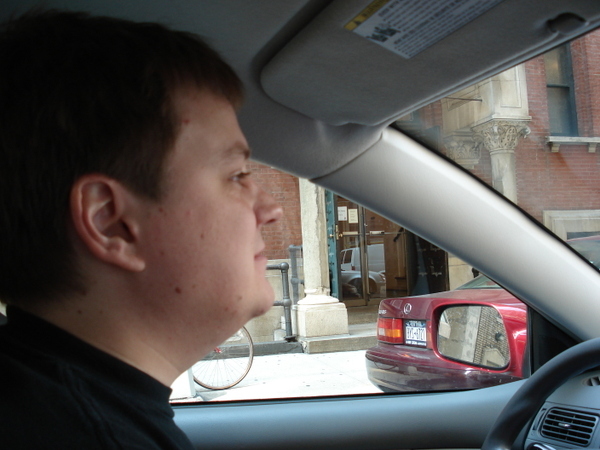 Craig drove us out of Manhattan with no incident. In fact, the worst part of getting out of the city was hauling our luggage through the subway. 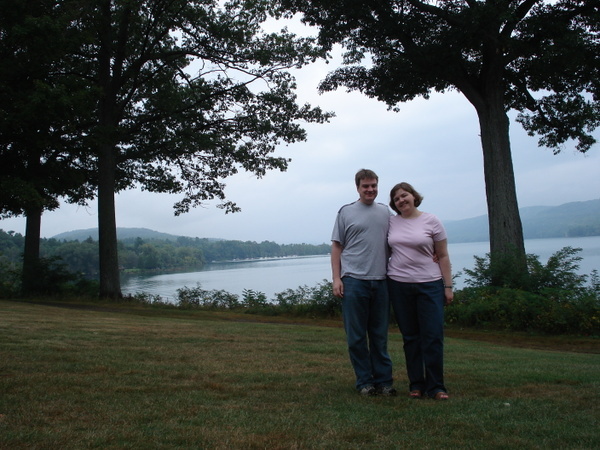 We drove up through the Catskills to Cooperstown, where we stayed at the best hotel ever. 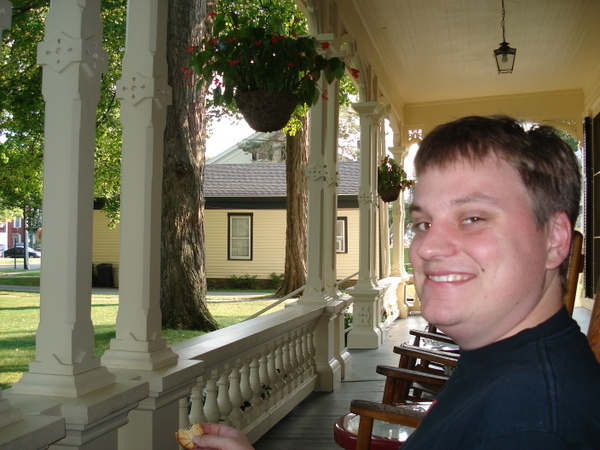 Having cookies and lemonade on the porch was a great antidote to the long drive. 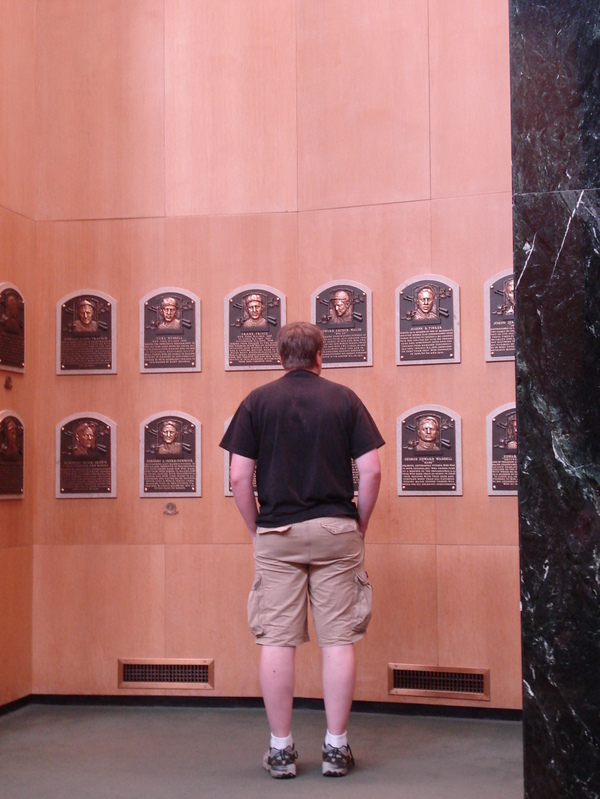 Inside the National Baseball Hall of Fame. It's not as big as we thought it was going to be - there's just not room to display all the things they have archived. There was a lot to like about Cooperstown beyond baseball. This is on the shores of Lake Otsego, behind the Fenimore Art Museum. There was also a living history museum, and tons of nice restaurants and breweries. All of the houses were gorgeous and well-maintained. 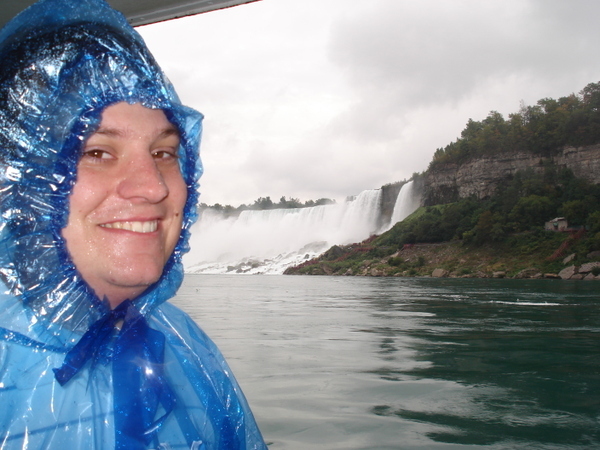 From Cooperstown, we drove on to Niagara Falls, where we got wet. Very wet. This gives you a better perspective of where we were standing in the front shot - you can see maroon decking just to the right of the falls behind Craig. We took an elevator down from the top of the bluff, then walked out under all the spray on the decks. 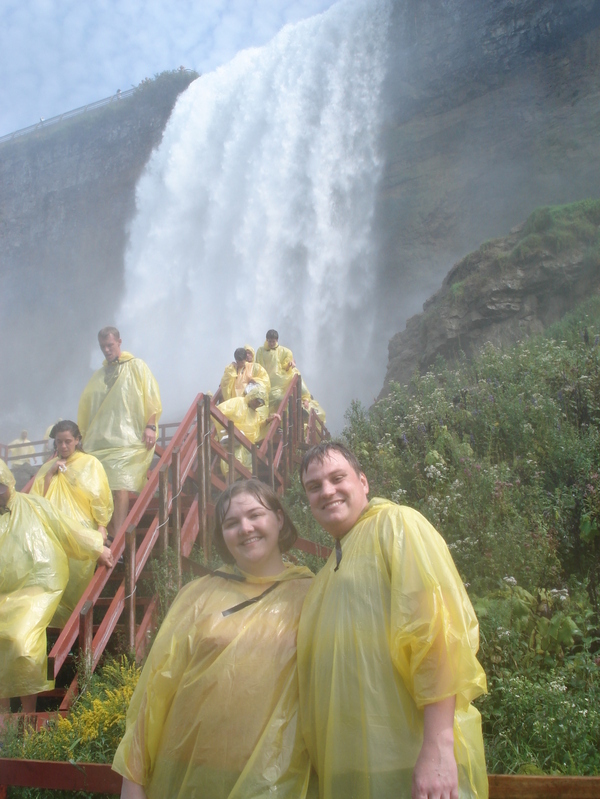 At one point, we were only 15 feet from the bottom of the falls, where the water hits at 70 miles per hour. 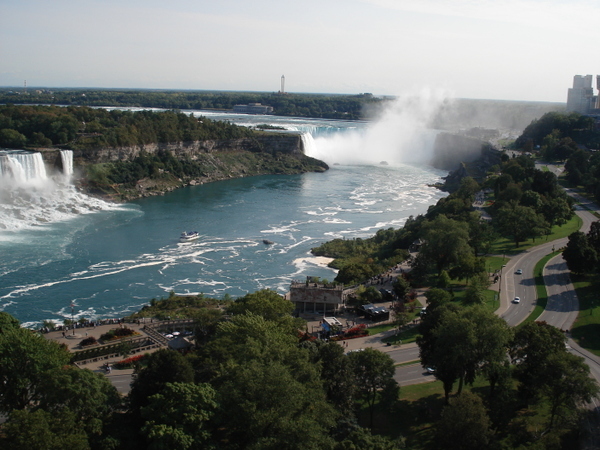 We shelled out for a room with a view of the Falls, and here's the payoff. It was great to crash at the end of the day and just be able to sit and look at this whenever we wanted to. The area around the actual falls is nice, but in just a couple of blocks, it turns into a soulsucking Disneyland/Vegas hybrid designed to surgically separate you from your money. Think wax museums and a WWE store. So, we spent a lot of time just looking. And it was worth it. 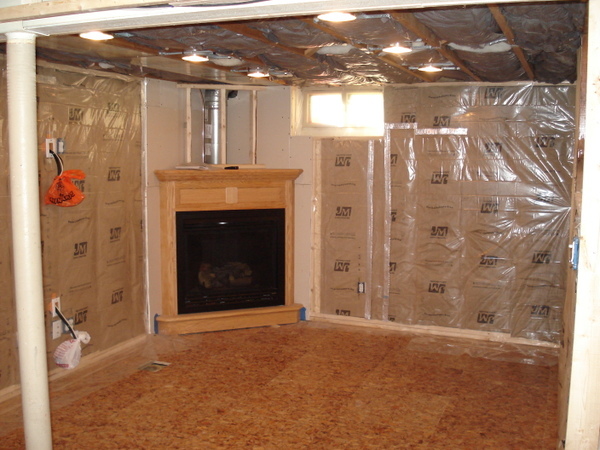 We're glad to be back, and are gearing up for a fall and winter full of basement renovations. There are a few other things going on with the house that I'll cover in good time. I also froze 25 pounds of Roma tomatoes from our CSA farm, so I'm sure there will be a post about marinara sauce in the future. Also, your reward for reading through all our pictures is the news that Craig has a new job. He'll be the third attorney in a three-attorney general practice firm, and he starts on Monday the 24th. Woo, Craig!